I was shopping with my wife today. On the discount shelf at Shoppers Drug Mart was a product called Aussie Nad's. It's a hair removal product, and really, from there, the jokes just write themselves! 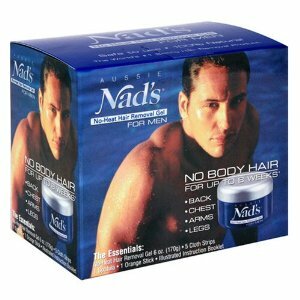 I just checked their website and it looks like they've already renamed the product to just "Nad's for Men". It mentions removing hair from the chest, back, arms, and legs but really... don't ya think it's just SCREAMING to be meant for the bits "down under"? I couldn't help but laugh at this one. I mean... the marketing people HAVE to have seen how comical this would be!! I guess the Aussies are to men as the Brazilians are to women! I'm looking forward with anticipation to the Duel's on Thursday and the Daytona 500 next Sunday. I'm hoping it's not the last time I look forward to Daytona for a long time. I'm not sure what to make of it. The Bud Shootout yesterday was different than anything we've ever seen before. We've seen pairs of cars hook up before and break away from the pack. But that was when there was a pack and the tandems would stick together for a sprint. If yesterday's race was any indication, now there's no more pack. There's these tandem pairs of cars all around the track, acting as one. If you don't have a partner, you're probably going to fall behind and I'm really not entirely sure why that is. I don't know why a single car can't stick to the back of a pair and keep up. It just doesn't seem to be possible. With that in mind, the racing is entirely different now. Is it better? Worse? The Shootout just wasn't long enough to get a good impression. I'm looking forward to Sunday to find out. The biggest question on my mind was what was going to happen on the last lap. Denny Hamlin answered that by bailing on his partner and trying to make a pass. It didn't work... but it might have if he'd picked another line. That means there's still going to be lots of drama at the end. Hopefully. If the ARCA race was any indication, I suspect the Truck race is going to be a boring affair. They had so much grip, and couldn't bump draft (similar to the trucks) that all they could do was run around the bottom of the track in single file. Anyone who tried to move up to make a pass, just fell to the back. There was one boring line, and that was that. I won't make any judgement calls just yet on whether they've ruined Daytona. I don't think they've made it better. It's novel... but I loved what it used to be. We'll see whether the novelty wears off or whether it's something entirely new and interesting that people will look forward to for years to come. One thing's for sure... it sure is fast!